African-American writer and poet Maya Angelou (1928–2014) was honored by universities, literary organizations, government agencies, and special interest groups. Her honors include a Pulitzer Prize nomination for her book of poetry Just Give Me a Cool Drink of Water 'fore I Diiie, a Tony Award nomination for her role in the 1973 play Look Away, and five Grammys for her spoken albums. 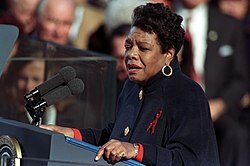 Beginning in 1982, Angelou held the first lifetime Reynolds Professorship of American Studies at Wake Forest University in Winston-Salem, North Carolina. She served on two presidential committees – for Gerald Ford in 1975 and for Jimmy Carter in 1977. In 2000, she was awarded the National Medal of Arts by President Bill Clinton. In 2010, she was awarded the Presidential Medal of Freedom, the highest civilian honor in the U.S., by President Barack Obama. More than thirty health care and medical facilities have been named after Angelou. She was awarded more than fifty honorary degrees. Rollins College, a liberal arts institution in Winter Park, Florida, honored Angelou in several ways, including numerous invitations to speak to its student body, an honorary degree in 1985, the institution of the Maya Angelou Resource Library in 1989, and a stone dedicated to her on the campus's Walk of Fame in 1994. ^ "St. Louis Walk of Fame Home". Stlouiswalkoffame.org. Retrieved 2015-04-17. ^ Manegold, Catherine S. (1993-01-20). "An Afternoon with Maya Angelou; A Wordsmith at Her Inaugural Anvil". The New York Times. ^ Brown, DeNeen L. (2014-03-12). "Maya Angelou honored for her first job as a street car conductor in San Francisco". The Washington Post. ISSN 0190-8286. Retrieved 2015-11-13. ^ Kevin McSpadden (2015-04-09). "Maya Angelou Stamp With a Quote From Another Poet Won't be Reissued". Time.com. Retrieved 2015-04-17. ^ Daniel, Fran (2017-02-16). "WFU dedicates residence hall that honors poet and author Maya Angelou". Winston-Salem Journal. ^ Palmer, Ewan (4 April 2018). "Who Was Dr. Maya Angelou? Google Doodle Celebrates 90th Birthday of Poet and Activist". Newsweek. Retrieved 15 April 2019.